Long term readers of our blog will know that we love Thailand. We lived there in 2002, travelled through the country as backpackers plenty of times, and visited for a short break with the girls. Apart from a couple of mid-range hotel stays in Thailand, I’ve mostly experienced it as a backpacker. I think I’m to embrace luxury Thailand holidays instead. The first time I ever had an inkling that Thailand offered more than low budget bungalows, or pink tents was in Railey’s Bay, Krabi. Coincidentally, that was when I was sleeping in the pink tent – the cheapest bed on the peninsula. It turned out it was one of the most amazing travel experiences I’ve ever had. 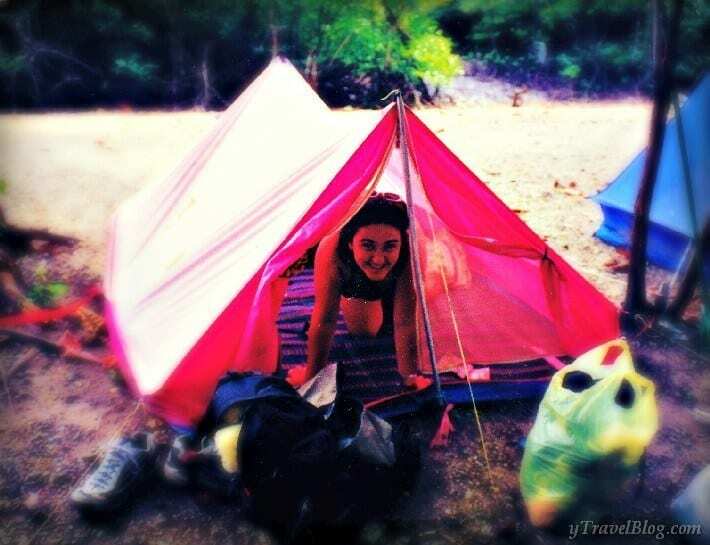 Not because of the pink tent, but because of the group of people I met and became close friends with. They were rock climbers from Sweden. There was a kiwi thrown in there and we swept up a few more Aussies. We spent the days climbing the limestone cliffs carved by nature’s hand with rock climbers in mind, and the nights twirling fire and partying in the common area beside the pink tent. We were hidden behind the mangroves on the less attractive East Railay Beach. At another end of that beach, and only accessible via a cave through the limestone mountain, was my paradise. It was 1999 and I still remember the way the breeze softly blew my hair, I can hear my laughter at the monkeys swinging on the vines beside as we walked, and the silence when we stepped out from the cave onto the beach. You know the silence that comes with the moment you feel your life has changed forever. It was a small beach, and just a short swim out at low tide were a few islands great for snorkeling. One or two long-tail boats were moored to the sand, and from them the locals sold tuna rolls and water. There was nothing else around except for Rayavadee. 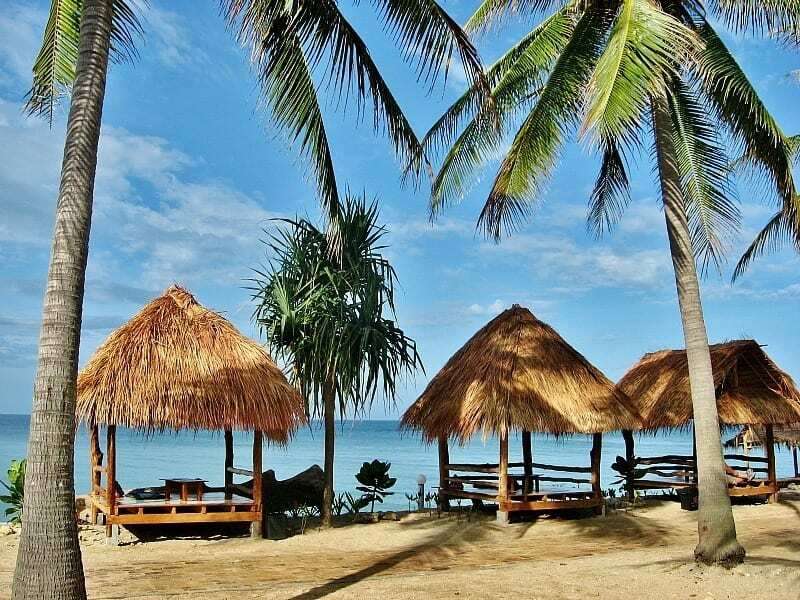 Behind the lush, jungle foliage, and situated discreetly amidst tropical gardens and coconut groves sat this exclusive resort with exclusive access to the most beautiful beach I’d ever been too. “One day I will stay in that Thai luxury resort” I said to my friends. I pined over it daily and tried to settle for my pink tent instead. I’ve still not been. Craig’s sister has. She used to work for Thai Royal Orchid Holidays and often visit Krabi and other islands on work trips. She stayed at many high-end luxury resorts and fell in love with luxury Thailand holidays. Even when it was her own holiday time, she’d stay at some of the most amazing properties: Rayavdee, villas with her own swim up pool, or personal butler. And then she’d tell me the price and I’d nearly die. Not because it was so over the top, but because it was so reasonable for a luxury beach resort. For the price of a hotel in Sydney, you got to have your own butler and a pool in your villa—with extraordinary views over the ocean. A friend asked for advice on places to stay in Thailand recently. I knew it was for a short break, so backpacking prices were not necessarily in need. And that is luxury in Thailand. It is not such a gigantic step for a backpacker – not as big as if you were doing it in the Western World. And I really believe that to have that luxury experience, Thailand would have to be one of the best countries in the world to do it. Why is Thailand a great choice for luxury holidays? The country is amazingly beautiful. If you go luxury in Thailand, then it is pretty certain you’ll have a villa on the most beautiful stretch of sand and azure water you could ever imagine, or you may even be perched high on the hill. The properties would be out of this world with world class facilities-perfect for honeymoon couples or those just wanting to escape the world for awhile. I would love to return to Thailand to have a luxury experience as I feel I would get more out of the property. I’ve been to Thailand so much, that I wouldn’t feel I was missing out if I just hung in my private pool overlooking the ocean all day. Filling in time with massages, butler delivered meals and reading a book. It’s the type of holiday where it’s not about discovery or exploration, more about giving rest and rejuvenation back to yourself. The service is outstanding. We get world class service when we go to Thailand as a backpacker, imagine it on the luxury end. We had a semi-luxury massage experience in Phuket when we were there in January. I loved it. I’ve always gone for the $5 Thai massages on the beach, which still rock, but I really enjoyed the tranquillity of this one. I definitely felt like I was worshipping my body a little more and giving it extra quiet space to just relax and be. Transportation would be better with luxury! There is no secret that roughing it in Thailand means you are crammed in the back of a songthaew, long-tail boat, min-van or tuk-tuk. It would be nice to escape the chaos and enjoy more of a comfy ride. More bang for your buck. You will just get more from your money when you have a luxury experience in Thailand. 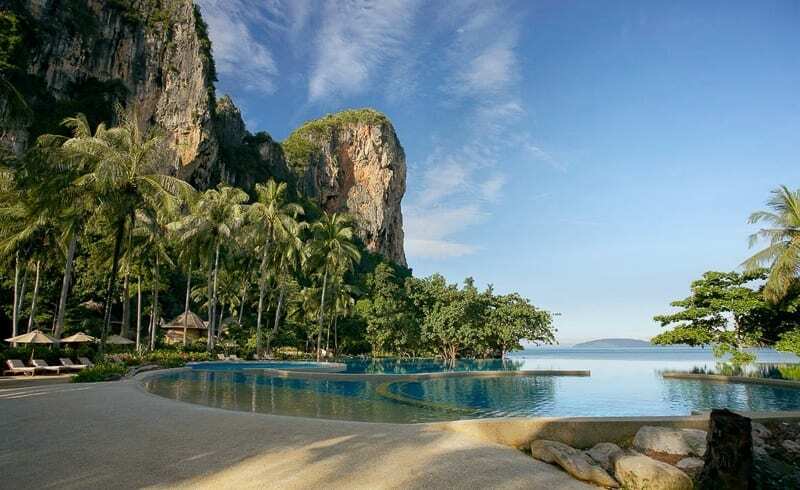 Trang has been on my list of places to visit in Thailand, and this luxury resort on a nearby tranquil island has me pining. “Let’s go,” Craig has just said to me as I explain the package on offer for it. Check The Seven Seas Resort in Trang here. So this one has nearly killed me. I’m not sure if it is the daily happy hour with free cocktails, the spa treatment thrown in, the beach yoga lessons, the Thai cooking class, or the option to have a sunset or sunrise facing villa. 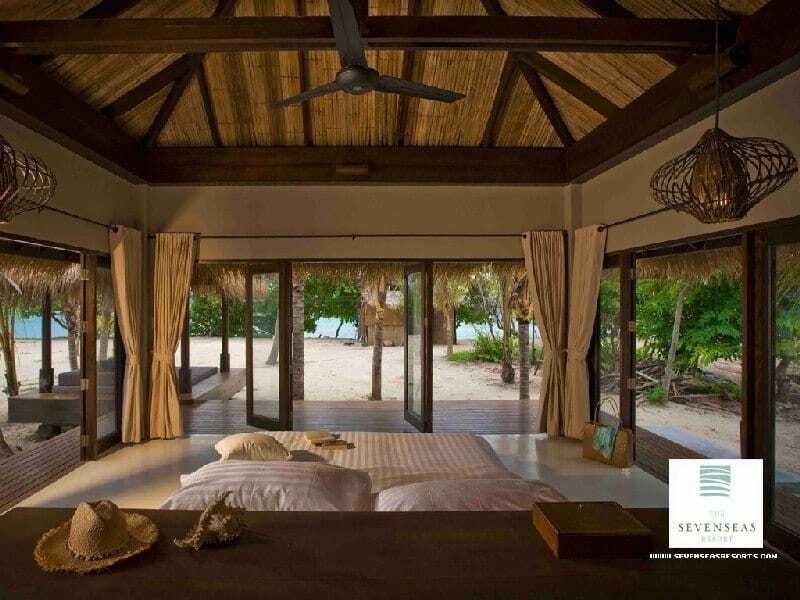 Soneva Kiri Koh Kood Beach Resort place could possibly knock off Rayavadee from the top of the list. This one’s for those how love a luxury mountain retreat. It promises Zen away from the hustle and bustle of Chiang Mai and has the pool villas that we are all searching for. 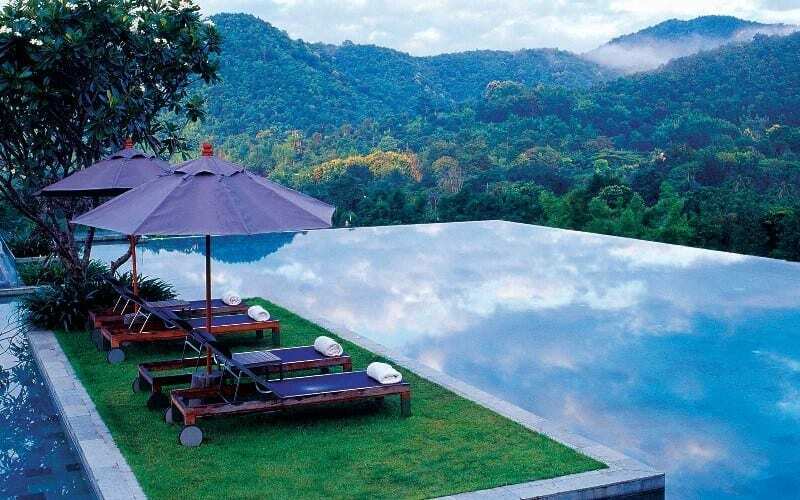 If you can’t find your Zen in Thailand, you can’t find it anywhere. The rooms look really homely here too. 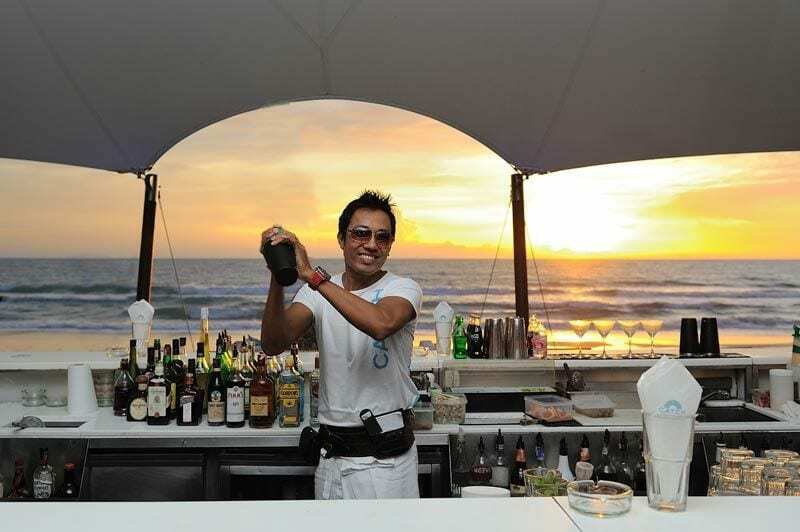 Catch Beach Club is where all the beautiful people go for sunset in Phuket. We ate a restaurant a couple up from here. Again, it was one of those Thai moments where we said, “One day we’ll eat there.” So for the Thai luxury experience it would be a good one. Oh, and the sunsets here are sensational. What’s your idea of a luxury holiday? Do you think Thailand is a great place for it? 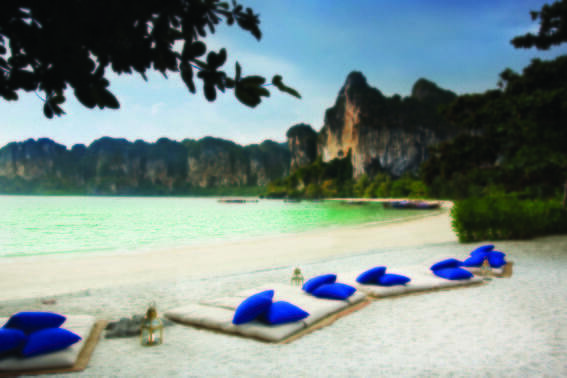 Have you experienced luxury in Thailand before? 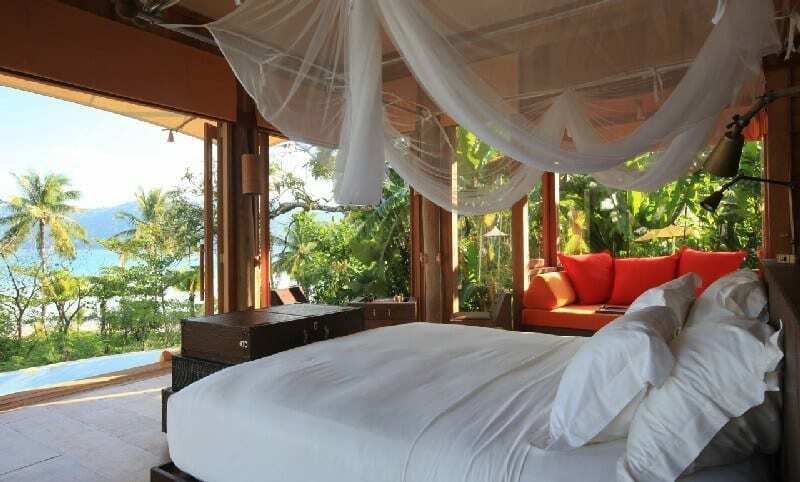 We had our honeymoon on Koh Samui 9 years ago – staying in luxury at the Sila Evason. It’s so what you say – got an amazing deal and got to live it up for a fraction of the cost here. Will be sharing some of my photos! We’ve only been to Thailand once. Being from an expensive country (Denmark) and having travelled in other semi-expensive countries (USA, mostly) Thailand totally blew our minds. We grabbed a last minute deal and got 16 days on Phuket (flight and hotel included) for around $1000. That’s an amazing deal when you consider how far away we were.. The hotel wasn’t luxury, but it’s the best we’ve tried so far. We went on some amazing full day trips, and for no money we got amazing experiences!! We’ll definitely be back to Thailand. You’re so right. The country is extremely beautiful and with those prices it might be our first luxury experience!! Ps. those photos really take me back… So incredible! Living in Chiang Mai, I take advantage of visiting places like The Veranda whenever I can – my friends and I will spend the after noon at the infinity pool there for less than $10! Sounds heaven. Treats like this are really needed. Ok that’s it… no more backpacking and staying in bed bug infested budget hotels any more!! My husband and I visited Thailand in June 2013 for 9 nights. We spent the first two nights in Bangkok at a midrange hotel in Sukhumvit and really enjoyed it. We then moved on to The Aquamarine Resort & Villa in Phuket. The resort was fab, but the rain ruined our plans on visiting Phi Phi Island 🙁 To make lemonade out of lemons, we hired a car and driver for the day and toured around Phuket. We went to the Monkey show, Big Buddah, and toured around Phuket Town. We even had an amazing experience with a whole bunch of monkeys and a bag of bananas on Monkey Hill! 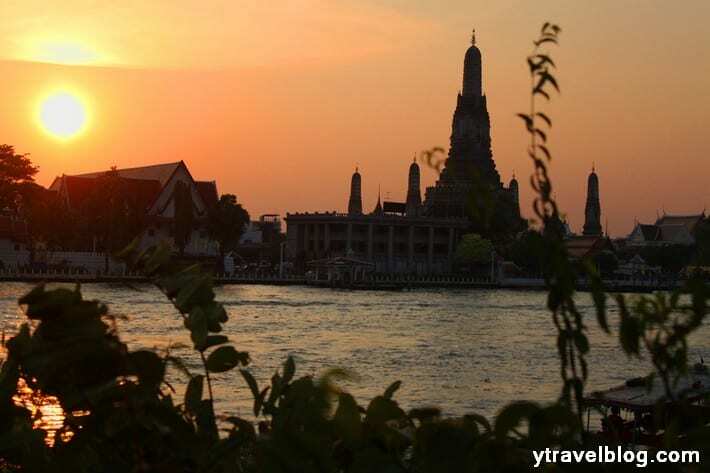 We then returned to Bangkok for two more nights. One night we spent at the Sky Hotel…which was OK. Amazing views, but far too touristy for us. Our last night was spent at the Summit Windmill Golf Residence, which was spectacular! Amazing Suites, Great food, and a pristine golf course. However, the highlight of the entire trip was visiting the Tiger Temple a few hours outside of Bangkok. Feeding, bathing, playing, walking and just experiencing Tigers from cubs all the way to grown adults was the best thing that ever happened to us. It really changed our lives! That’s the great thing about Thailand. If you don’t have much money, you can travel for really cheap. If you have a lot of money, you can find really nice accommodations, and it’s still not very expensive compared to other countries. I recently flied to Thailand and enjoyed a lot there. This is memorizing me the awesome moments that I spent there. Thank you very much for sharing this informative information. Sounds like you have pleasant memories of Thailand that will last a life time; Enjoyed reading your article and viewing your wonderful pictures. we made a short trip to Chiang Mai few days ago. A beautiful environment and we have found a exellent villa for rent. It was a recommendation from our friend. A quiet place with a large pool, my wife loved it. The golf green located near, left nothing to to be desired. At the weekend is a huge market in Chiang Mai Centrum. The not to be missed. If you wish, the villa can watch. It is also offered to stay for more than 12 people. Look at to site http://chiangmai-villa.com/ and have a nice time. thailand is famous with tourism. Among the resorts that you mentioned in your list, I think my all time favorite will be the Veranda High resort. Super love how secluded and serene this place is, the food and staffs were all friendly when we stayed here and the pool… ughh, the pool is magnificent and breath taking.